Meta-analysis requires either appropriate summary statistics or individual participant data to be available. For continuous outcomes, incomplete reporting of the mean and standard deviation (SD) required for meta-analysis potentially introduces bias and imprecision, if it leads to studies being omitted from the analysis. Practical statistical methods are therefore needed to deal with the situation where these summary statistics are not available. After systematic literature reviews to identify methodological approaches used to deal with missing mean or variability summary statistics, the Cochrane Statistical Methods Group conducted an online survey of authors of Cochrane Stroke systematic reviews of rehabilitation interventions. This established how often continuous outcomes were studied, the frequency with which missing means or SDs were encountered and the methods that were used to handle this. Using data from a Cochrane stroke review, they compared statistical methods for recovering missing mean or SD values, assessing how accurately each approximated the true meta-analysis treatment effect and its precision. Unreported mean or SD values have been a substantial issue for systematic reviewers in stroke. 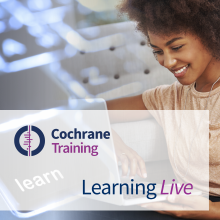 In these videos, originally part of the Cochrane Learning Live webinar series, Chris Weir summarises the methodology systematic review findings and discusses the suitability of methods based on alternative summary statistics to recover the missing mean or SD. This guidance on dealing with unreported mean and SD values will potentially assist reviewers to maximise the evidence included in meta-analyses. The webinar was delivered in February 2019. Below you will find videos from the webinar along with the accompanying slides to download [PDF]. Chris Weir holds a Personal Chair in Medical Statistics and Clinical Trials, in the Usher Institute of Population Health Sciences and Informatics at the University of Edinburgh. He leads the health services research theme within the Edinburgh Clinical Trials Unit statistics group and contributes to its clinical trials methodology research programme. Following a PhD and post-doctoral research fellowships at University of Glasgow developing and evaluating expert system-based decision-support in the clinical management of acute stroke, he worked as consultant and then senior statistician at the Robertson Centre for Biostatistics, University of Glasgow. In 2010 he moved to University of Edinburgh where, in addition to this webinar topic, his research interests include statistical methods for evaluating potential surrogate outcomes; adaptive designs in early phase clinical trials; and cluster-randomised trials.